Korean Air has announced an interline agreement with Flybe, which will enable agents to book Korean Air flights from regional airports in their global distribution system. Travel agents will be able to ticket their clients travelling from the UK Regions, bound for South Korea, or any onward destination on the Korean Air network, via the Korean Air gateways of London Heathrow, Paris Charles de Gaulle, or Amsterdam Schiphol. Beyond their Seoul Incheon hub, key destinations sold by UK agents include up to twelve cities in Japan; twenty-five in China; Sydney and Brisbane in Australia; Auckland, New Zealand and Nadi, Fiji. Korean Air’s European flights have an early evening departure, facilitating connections with Flybe UK origin flights, with return flights from Seoul arriving early afternoon, giving similar ease of onward transit. Luggage may be tagged through to final destination. 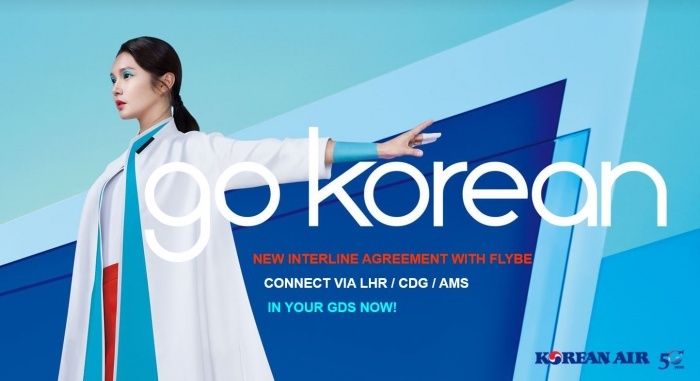 Korean Air regional manager UK & Ireland, Roy Kim, said: “The new interline agreement with Flybe is great news for the trade and our regional customers, who will benefit from improved choice of connecting flights and pricing.